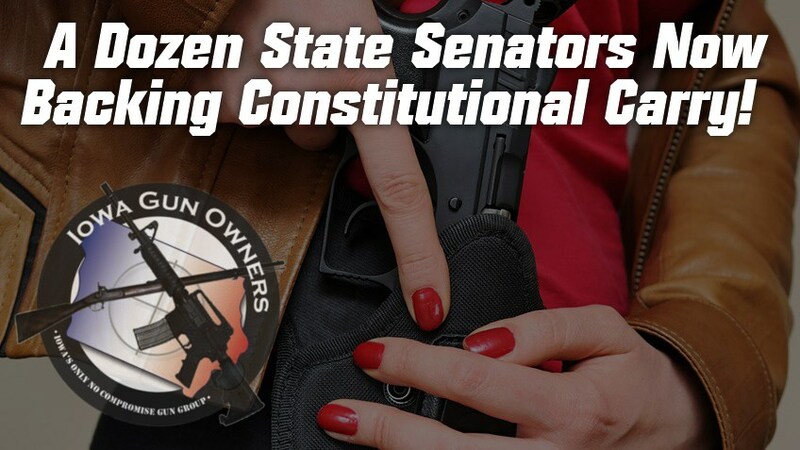 A Dozen State Senators Now Backing Constitutional Carry! It’s been an extremely busy week in the fight for the Second Amendment in the State Capitol! Please take a moment to thank them for their support of this important legislation, by sending them this PRE-WRITTEN email here. It only takes one mouse click! But if your Senator’s name is not listed — I need you to contact them right away and urge them to join their colleagues and add their name onto this bill! You can send them our PRE-WRITTEN email right now, by hitting this link! Constitutional Carry is sweeping the nation right now and is already law in thirteen states, and it’s on the move right now in another dozen! Right now, while we have these legislative majorities, is our best chance to advance this legislation here in Iowa. So please take a moment to thank the legislators listed above, but be sure you contact the names listed below as well, and make sure that they stand up for gun owners. Constitutional Carry is a very simple concept. If you’re legally eligible to own a firearm, you would be able to carry that firearm without having to pay fees or add your name to a government database! But momentum is key right now, before we begin the committee process. So please contact the following Senators, who we believe are likely to cosponsor if they hear from gun owners in their district. We’ve made it extremely easy for you to take action. Simply click here to email them all, at one time! If you click on the names above, you can message them on Facebook and you can call them using the numbers we listed above. I can’t stress enough how important it is that these legislators hear from you before the session reconvenes on Monday. The cosponsor window will be closing late next week. Please act now! When you’re done, please share this with your friends and family and urge them to send this pre-written email, too! P.S. Momentum for Constitutional Carry is booming in Des Moines. Already we have a dozen legislators backing this bill by cosponsoring it. If your Senator was one of the legislators who cosponsored, listed above, send them this thank you. But there are many other Senators who we believe will back this bill if they hear from gun owners. Please contact them, by forwarding this PRE-WRITTEN email right now! Please take action right now, and when you’re done, send this to your pro-gun friends and family as well so that they can add their voice to this fight! Two More Days! Act Now!